Properties in Botanical Gardens average 4.5 out of 5 stars. WALK TO TOWN! RIGHT IN TOWN EASY ACCESS TO EVERYTING KINGSTOWN! Property 7: WALK TO TOWN! RIGHT IN TOWN EASY ACCESS TO EVERYTING KINGSTOWN! KINGSTOWN 2 BEDROOM RIGHT IN TOWN! WALKING DISTANCE TO EVERYTHNG VINCY! 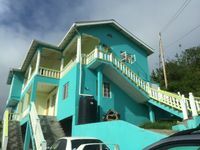 Property 9: KINGSTOWN 2 BEDROOM RIGHT IN TOWN! WALKING DISTANCE TO EVERYTHNG VINCY! 2 bedroom comfortable luxury apartment with private patio and ocean views. Property 24: 2 bedroom comfortable luxury apartment with private patio and ocean views. 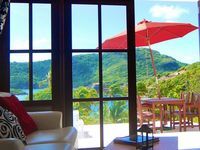 We loved this apartment with a stunning view of the Caribbean from the balcony which made us shout with surprise when we arrived. Sunsets and quiet mornings were our mainstay. Everything was clean and wonderful, with handy nearby stores. Gatlin was welcoming and took us to nine mornings. She was helpful but not intrusive. The only drawback was the steep climb up to the house, but we thought of it as excellent exercise. We would return in a minute.